April 15, 2019: This near-infrared, color view from the Cassini spacecraft shows the sun glinting off of Titan's north polar seas. On its final flyby of Saturn's largest moon in 2017, NASA's Cassini spacecraft gathered radar data revealing that the small liquid lakes in Titan's northern hemisphere are surprisingly deep, perched atop hills and filled with methane. The new findings, published April 15 in Nature Astronomy, are the first confirmation of just how deep some of Titan's lakes are (more than 300 feet, or 100 meters) and of their composition. They provide new information about the way liquid methane rains on, evaporates from and seeps into Titan—the only planetary body in our solar system other than Earth known to have stable liquid on its surface. Scientists have known that Titan's hydrologic cycle works similarly to Earth's—with one major difference. Instead of water evaporating from seas, forming clouds and rain, Titan does it all with methane and ethane. We tend to think of these hydrocarbons as a gas on Earth, unless they're pressurized in a tank. But Titan is so cold that they behave as liquids, like gasoline at room temperature on our planet. 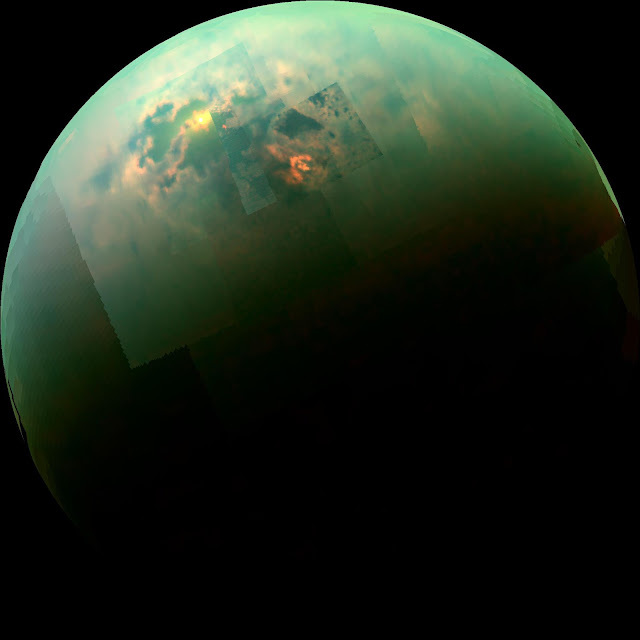 Adding to the oddities of Titan, with its Earth-like features carved by exotic materials, is the fact that the hydrology on one side of the northern hemisphere is completely different than the that of the other side, said Cassini scientist and co-author Jonathan Lunine of Cornell University in Ithaca, New York. On the eastern side of Titan, there are big seas with low elevation, canyons and islands. On the western side: small lakes. And the new measurements show the lakes perched atop big hills and plateaus. The new radar measurements confirm earlier findings that the lakes are far above sea level, but they conjure a new image of landforms—like mesas or buttes—sticking hundreds of feet above the surrounding landscape, with deep liquid lakes on top. The fact that these western lakes are small—just tens of miles across—but very deep also tells scientists something new about their geology: It's the best evidence yet that they likely formed when the surrounding bedrock of ice and solid organics chemically dissolved and collapsed. On Earth, similar water lakes are known as karstic lakes. Occurring in in areas like Germany, Croatia and the United States, they form when water dissolves limestone bedrock. Alongside the investigation of deep lakes, a second paper in Nature Astronomy helps unravel more of the mystery of Titan's hydrologic cycle. Researchers used Cassini data to reveal what they call transient lakes. Different sets of observations—from radar and infrared data—seem to show liquid levels significantly changed.